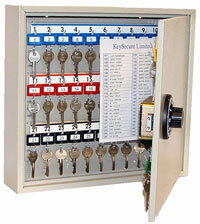 Distributing nationwide, KeySecure are committed to a quality of service and product which exceeds expectations. We specialise in key security systems, safes, padlocks, safety mirrors, cash/deed boxes, lockout systems and other ancillary security products specified by various bodies including government departments. Our many customers include builders merchants, architectural ironmongers, locksmiths, security specialists and industrial catalogues. Through manufacturing we also provide bespoke work and specials to satisfy our customer requirements. Website by Mushroom Internet, Web Design, Print Design and SEO.